Do you love animals or have you ever felt called to help animals? You are not alone. In fact, you are in the majority. As more and more people find out about how animals are treated in modern day factory farms, it will become more important to live how God would want us to live. If you live by these 25 rules, the day will come when animals are free to live out their lives the way God originally intended for them. You show love to animal abusers regardless of what they do to you or the animals because it is the only way to transform your enemies into your friends. Speciesism means discriminating against animals (other species) simply because they are not human. For example, if you are in minor discomfort and an animal is in excruciating pain, in that specific situation, the pain of the animal is more important than your pain and the animal should take precedence over you. Even though you are more important than that animal, if you were to say that your rights always trump the animals' rights (because the animal is an animal and you are a human), then you would be being speciesist. Believe it or not, but Christ had no problem relating himself to a chicken (Matthew 23:37) of all things. Someone who is a speciesist would never relate themselves to a chicken. Christ raises the worth of a lowly chicken all the way up to his own level and he does it to describe completely selfless love. You will raise the worth of the animals because Christ taught you to. Serial Reciprocity (or “Pay It Forward”) Ethics requires asking the beneficiary of a good deed to repay it to others instead of requiring the good deed to be repaid back to ourselves. Christ does not love us because you are deserving, he loves you because the Father first loved him. In return, you do not love the animals because they are deserving, you love the animals because Christ first loved you. In succession you "pay it forward" to those you have been given dominion over. Christ gave us the greatest gift anyone can give: he laid down his life for his sheep. At our turn, you "pay it forward" by realizing the act of generosity the Good Shepherd gave to his sheep and in return, you give acts of generosity to your sheep. In perfect "pay it forward" fashion, Christ does not ask us to return the favor to himself; he asks us to return the favor to the rest of creation. Anyone who practices "pay it forward" ethics will make it self-evident that they are a disciple of Christ. "Paying it forward" to the animals is the next logical step based on the dominion you have been given. Christ was given dominion over us; he did not stuff us in factory farms, slit our throats and eat our body parts; he laid down his life for us. When people pay to have animals sent through factory farms, they are showing the world that they are not a true disciple of Christ. When we look to the cross and see the nails being driven through the innocent lamb, it is a perfect reminder of the suffering the innocent animals experience every single day because of the oppression we force on them. If you truly understand the act of love the Good Shepherd did for his sheep, you naturally want to "pay it forward" to the animals. People will turn to their own ways and continue to eat factory farmed meat. You will forgive them. You serve the animals precisely because you are greater than them. Food that endures to eternal life is more important than food that spoils. You turn the other cheek and practice complete non-violence. Sometimes the only way to stop the cycle of violence is by personally taking the brunt of that violence. You turn the other cheek to your enemies so that you can win them over with love. You are a Good Samaritan who helps those in need and applies mercy to those who need it. You apply mercy, and not speciesism. God did not desire the sacrifice of innocent animals. He wants you to put mercy ahead of sacrifice, slavery, sexism and speciesism. Christ came not to help the healthy, but the sick. It is not the healthy who need a doctor; it is the sick (which means every single one of us humans). God’s ways are not our ways. If we had it our way, we would destroy our enemies. However, in God’s plan, it is our enemies who are currently causing cruelty and suffering to God’s creation that are ultimately going to be the ones responsible for liberating the animals from their current oppression. Remember that many people who lived only a few hundred years ago were genuinely good people and yet they still did not recognize the basic human rights of women, children, and African Americans. You must remind people who are causing suffering to animals that God did not come to judge them, he came to set them free. Until you change people’s hearts through non-judgmental love, you will never bring the Kingdom of Heaven to earth. Only when our enemies’ hearts are changed will we truly have animal liberation. When you try to make yourself happy, you paradoxically make yourself unhappy. Christ understood that you fail to attain pleasure if you directly seek that pleasure for yourself. It is only when you focus your efforts on making others happy, that you yourself will truly find happiness. Your short life on earth is not meant to be spent devouring factory farmed animals. Your life on earth is meant to be spent doing the will of the Father. "My food", said Jesus, "Is to do the will of him who sent me and to finish his work". Christ understood that you are personally required to give up selfish pleasures to help alleviate someone else’s pain. It is a small pleasure you are giving up every time you refuse to eat animals. Yet by refusing to eat animals, you personally prevent the immense pain and suffering of thousands of animals in factory farms over the course of our lives. Christ took this principle to the extreme when he decided within his heart to free the animals from the temple and become a ransom for all of creation; even though this would nail him to a cross. Although Christ did not want to suffer immensely and he struggled against having to suffer, his desire to do the will of the Father was stronger than any of his own personal desires. You eat with everyone because Christ ate with everyone. This means that you eat with people who eat meat; even factory farmed meat. Nobody is rejected from the invitation to join a seat at the table of the Kingdom of Heaven. God's love is inclusive. Every child of God has a seat waiting for them. Since Christ gave his life as a ransom for our sins, there is no sin big enough that will deny them a place at our dinner table. There is no such thing as a righteous table unless Christ is sitting at one of the seats. When Christians eat factory farmed meat, they send a clear message to new believers of the faith: God does not care about animal suffering. This in turn makes new believers question whether God is someone who deserves to be worshipped at all. We effectively push new believers away from ever believing in Christ because our actions do not correlate with a loving God. When new believers look at God’s actual evidence, they see that dogs, cats, pigs, chickens, and countless other sentient beings can feel pain and suffer just like we do. But when those same new believers turn to look at Christians who eat factory farmed meat, they begin to question why they would ever want to follow Christ if believing in him does not have the power to transform their lives in a direction away from so much suffering. You have a special obligation to pay attention to what you eat so that you do not turn away new believers from the faith. You give up factory farmed meat so that you show people that Christ is a God of love, compassion and mercy. If anyone causes one of these little ones--those who believe in me--to stumble, it would be better for them to have a large millstone hung around their neck and to be drowned in the depths of the sea. Traditional family relationships are secondary to the Kingdom of Heaven. If you are torn between loving Christ and loving your family members or yourself, you must be willing to choose Christ over your family and even over your own life. If anyone comes to me and does not hate father and mother, wife and children, brothers and sisters--yes, even their own life--such a person cannot be my disciple. You will be hated for pointing out the sin of others who oppress animals through the status quo. While everyday people sell out for earthly possessions, disciples of Christ will never sell out for anything this world has to offer. Instead, you give your earthly possessions away so that you can set the oppressed free. God has written the golden rule on your heart. It seems like common sense but not all people realize that the golden rule applies to animals as well. The golden rule simply means to treat others how you would want to be treated if you were them. You do not have to treat animals like humans, however, but you should still recognize that animals feel pleasure and pain just like you do. Even though humans are worth more than animals, if an animal is in excruciating pain and you are in minor discomfort, whose pain is more important at that time? If you follow the golden rule, it would be the animals pain of course. Put another way, if you happened to be born as an animal, would you want to go through a factory farm? Of course not. Jesus tells a story called "the Sheep and the Goats" where how you treat the least among us is how you will be judged at the end of the world. 2000 years ago when Jesus taught this, many people did not understand that the golden rule applied to other humans of a different race. If Jesus were to teach this today, I think he would update it to include how you treat animals. Even though Christ was given dominion over humans, he used that dominion to serve them. Even though you have been given dominion over the animals, you use that dominion to serve them. The Good Shepherd serves the sheep. Christ tells us that the good shepherd leaves ninety-nine of his sheep to find even one lost sheep. Anytime there is an animal who needs your help, go out there and help them. Christ tells us that you are to love as he loved. Slitting the throats of the animals you have been entrusted to is not loving them as Christ has loved us. Not only do people break the Golden Rule when they kill the animals (because, face it, who of us would want to be killed so someone could eat us if we were the animals? ), but they also make a mockery of the dominion God has given us. Christ used his dominion to set his sheep free; the next logical conclusion is that you use your dominion to set your sheep free. For whatever reason, our ancestors struggled to learn that racism was wrong and breaks the golden rule. Today, people struggle to realize that speciesism (discrimination against animals simply because they are animals) is wrong and breaks the golden rule. By loving animals, working to set them free, and showing that you are called to serve them, you are spreading seeds all around us. You might not live long enough to see the full harvest collected from those seeds, but you know the harvest is coming. 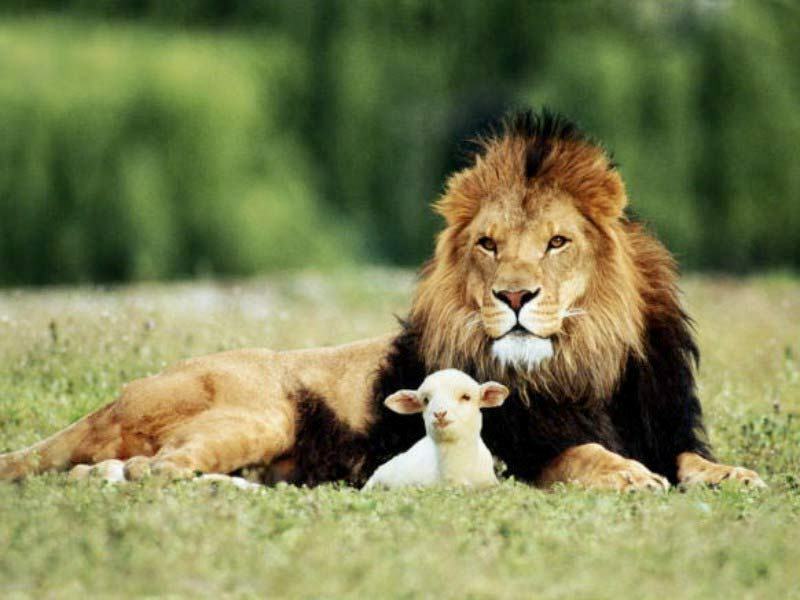 God's dream is for the wolf to live with the lamb. The bible tells us that in the future, not only will humans not harm other animals, but even carnivorous animals will not harm other animals. When you follow the example of Christ and devote your lives to your sheep, you will be building the foundation for the wolf to live with the lamb. This might seem impossible at first, but with God, nothing is impossible. If God is love, then how is slitting the throats of animals and eating their factory farmed body parts following love? The human body is not meant to be the grave site of dead animals; the human body is meant to be the place where love lives. True love has no room for selfish desires. Know that you are forgiven for the harm you have caused animals in the past. Now leave that in the past and start helping animals.